Over the past couple of years, Sony has struggled against the forces dominating the high-end smartphone scene. Its top handsets, although good, all lacked that extra mojo needed for a phone to truly stand out. Now, however, it looks like Sony may finally have a winner on its hands, namely the Xperia Z2. Long story short, it is an awesome smartphone, and if you're not convinced, feel free to read our in-depth Sony Xperia Z2 review. 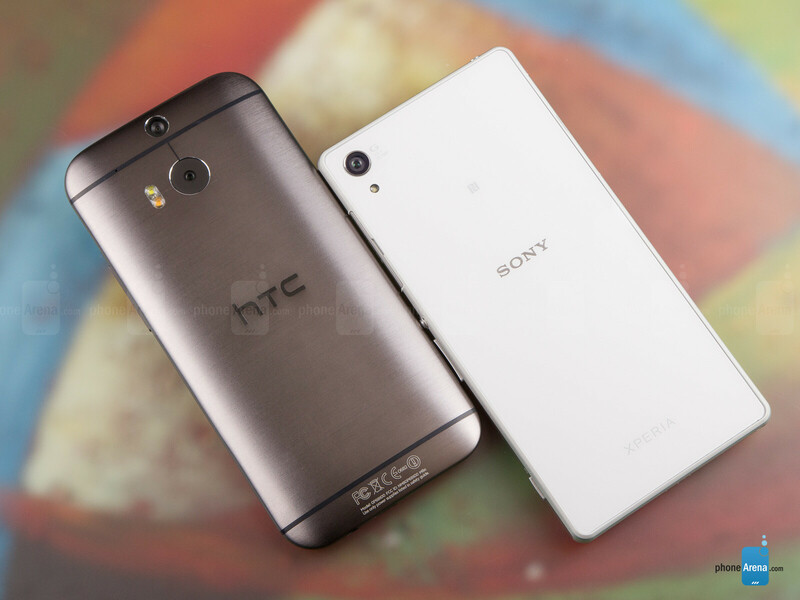 But now that the Sony Xperia Z2 has finally launched, it has to compete against a number of flagships from other well-known companies, and one of its rivals happens to be the HTC One (M8). There's a lot to love about the latter – it looks great, runs flawlessly, and those front-facing speakers sound pretty darn amazing. 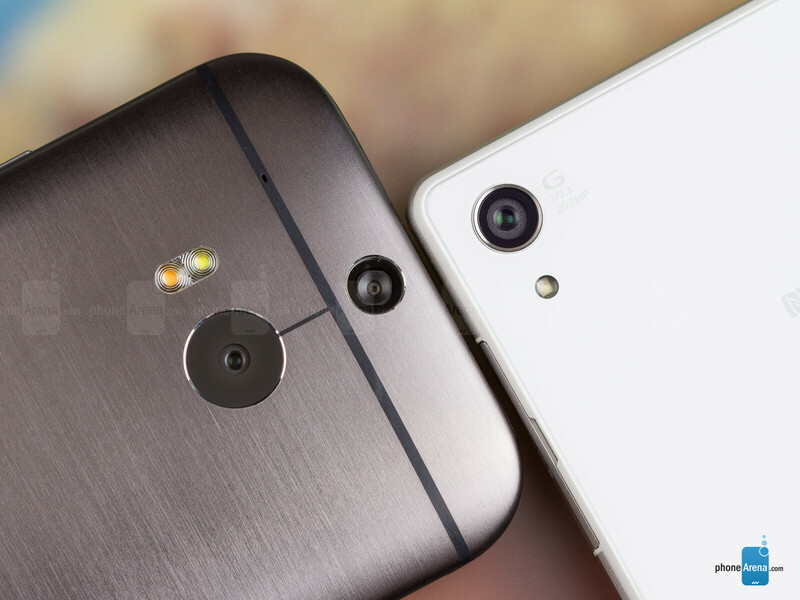 Yet is the HTC One (M8) better than the Sony Xperia Z2? Read on to learn more. 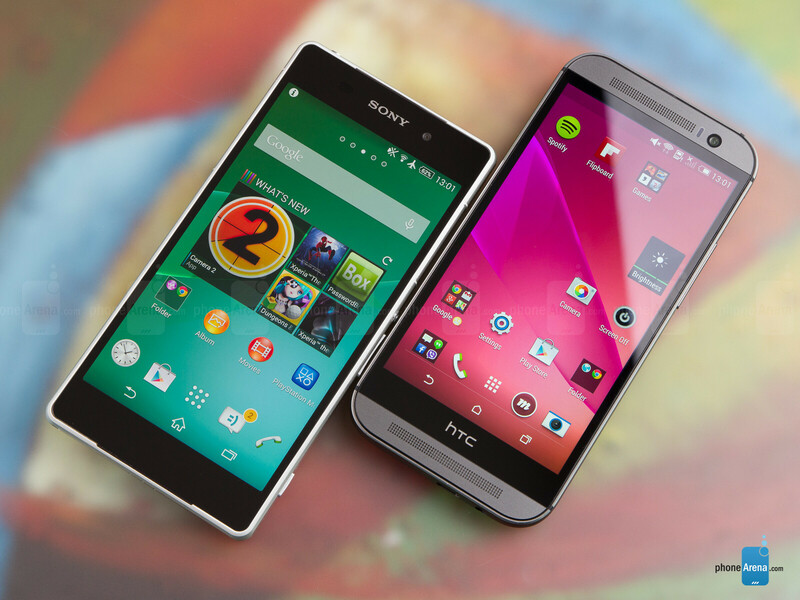 Both the Sony Xperia Z2 and the HTC One (M8) rank near the top of the “awesome” scale with their outstanding designs, and picking a favorite isn't as easy as it seems. That's probably why having them side by side for a comparison makes us feel as if we're in the middle of a clash between Thor and Superman. Sony's flagship is a gorgeous, flat piece of glass and metal that gives us a solid, reassuring feel when held. Its rectangular shape will not appeal to everyone, but we think that it doesn't look bad at all. What really bothers us a bit, on the other hand, is that the phone feels quite large when gripped, partly because Sony's trademark OmniBalance design relies on straight lines instead of curves, and partly because, well, the phone is pretty big in size. As for the HTC One (M8), it is an awe-inspiring phone encased in a beautiful, metal-made body, and we can't help to think that the general audience would find it more attractive, at least visually, than the Xperia Z2. What's more, although HTC's top model is about as wide, as tall, and as heavy as its rival, it fits better in the palm thanks to its curvy corners and back side. True to its design traditions, Sony has placed the power and volume keys on the right side of the Xperia Z2. They are easy to reach, but somewhat lacking in feedback. Below them resides the 2-stage camera shutter key, which is used for taking pictures and for launching the camera from any screen. 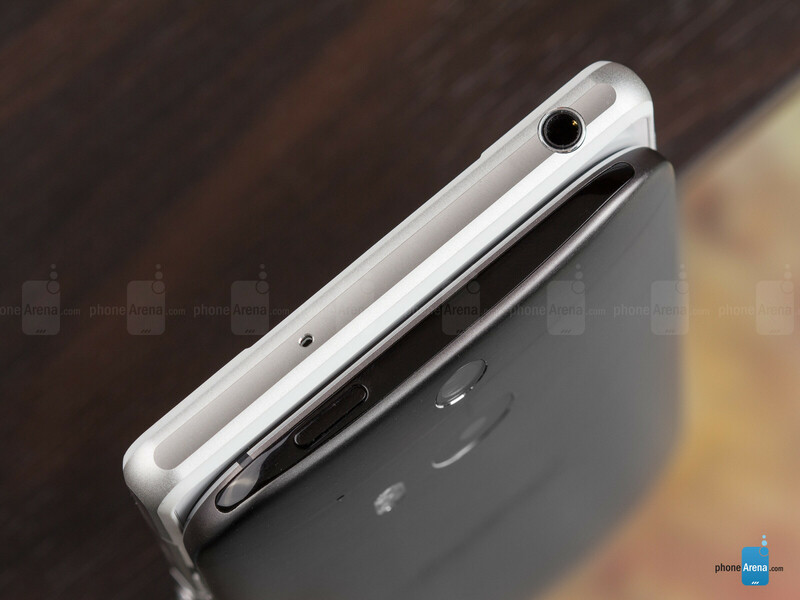 HTC has chosen to place the power key on the top edge of the (M8). Reaching it is a bit difficult since there's quite a bit of stretching that an index finger has to perform. To remedy the situation, HTC has added the option to activate the phone's screen with a double tap. The volume key is on the right side and could have had a little bit more travel to it. 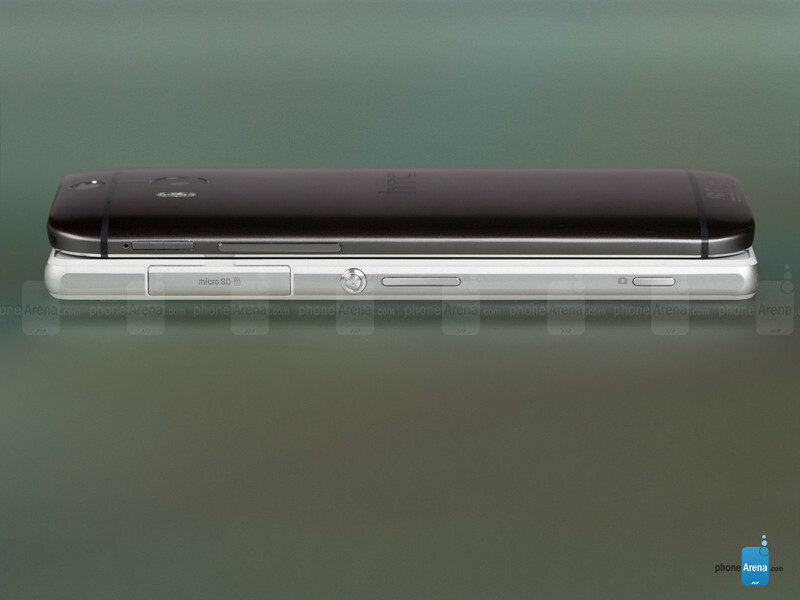 Most of the ports on the Sony Xperia Z2 are protected by flaps, and for a good reason. The handset boasts an IP58 specification, which means that it is resistant to dust and water damage, unlike the great majority of the smartphones around. It is not invincible, however, so don't dip it in the hot tub just to see how much abuse it can take. The HTC One (M8) should also be able to withstand a light water splash, but a dip in a pint of lager could be fatal. Sony has placed the Xperia Z2's SIM card and microSD card slots on its side where one of the aforementioned flaps keeps them safe. The cards placed there shouldn't be hard to eject if that is needed – all it takes is a fingernail or the tip of a pen. With the HTC One (M8), however, you'll need a pin or a similar tool to get its SIM or microSD card out as they both are placed in their own slide-in trays. Both smartphones sport a pair of front-facing speakers, which is a perk you won't get from another maker's flagship. That produce high-quality stereo sound, but we'll save our comments for when we get to the multimedia part of this comparison. The Sony Xperia Z2 sports a 5.2-inch touchscreen with a resolution of 1080 by 1920 pixels, while the HTC One (M8), despite being about as large as its rival, packs a slightly smaller, 5-inch 1080 by 1920 pixel panel. Not that a difference of 0.2 inches is a deal breaker, but it still counts as an advantage for the Z2. Details in images shouldn't be a concern regardless of which phone you pick. Both smartphones have more than enough pixels per inch stuffed in their screens, which explains why high-res images displayed on them look amazing. You'll be bombarded with buzz words when reading the description for the Sony Xperia Z2 display and the technologies thrown into it. First of all, the panel is of the IPS LCD variety. It also touts Sony's Triluminos display tech with Live Colour LEDs, which work in tandem to deliver a broader range of displayable colors and a more uniform brightness across the screen, according to the manufacturer. On the software side, the X-Reality image enhancement engine adds extra sharpness and contrast to photos and videos viewed in the phone's gallery. To put things in plain words, the Z2's display is a beauty that produces lively, eye-catching color hues even when viewed at an angle. Color accuracy isn't perfect, as our measurements demonstrate, but the screen is better in that respect than Sony's previous flagship models. We got a color temperature of 6900 kelvins, which is very close to the reference point of 6500K – whites are displayed very faithfully because of that. Overall color vibrancy is increased by a notch, and whether you like that or not would depend on your personal preferences. 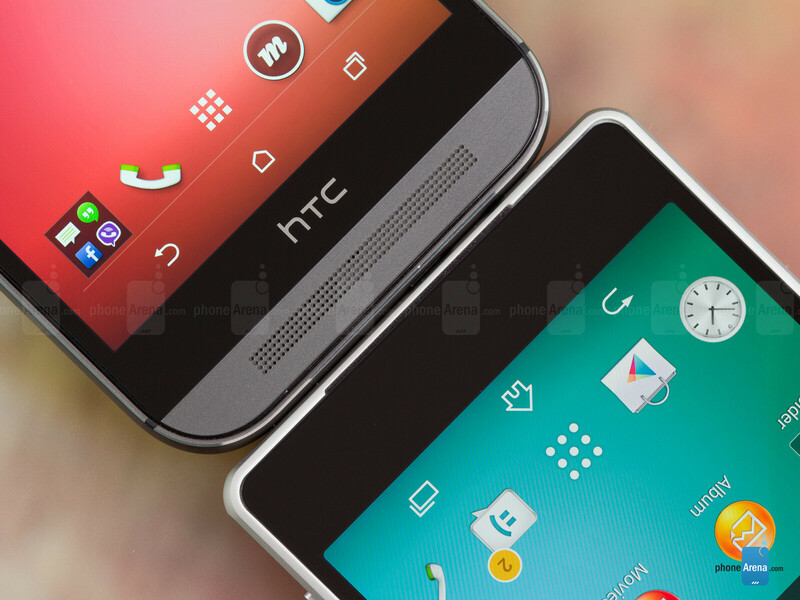 The HTC One (M8) comes with a Super LCD-3 display that delivers the goods. Next to the Z2's display, however, it is clear to see that M8's panel has a blueish tone to it, visible when displaying white or shades of grey. Our measurements confirm its presence as HTC's flagship has a display color temperature of 7150 kelvins. It is close enough to the desired reference value, but not as close as the Z2 gets. At the same time, colors don't look as vibrant as they do on the screen of the Z2, but technically, they are represented more accurately, and that is, again, evident from our display benchmarks. Outdoor visibility isn't an issue with any of these two phones. That's partially due to their adequate brightness output – the Z2 clocks in at 454 nits while the (M8) gets to 490 nits – but also because their screen surfaces manage to filter out some of the sunlight that hits them. Still, if we had to pick a favorite, that would be the One – its screen is a bit easier to see in broad daylight. When set to minimum brightness, both phones get down to 16 nits of brightness, which is tolerable, but probably not good enough to ensure a comfortable viewing experience at night. The Galaxy S5, in comparison, can reach a figure of 2 nits with its screen. Z2 looks pretty cheap and not classy. The white trim ruins it. Are you drunk or what?? I think your profile pic exactly fits you! Glad to know my opinion deeply hurts your poor feelings LOL. I think my profile pic exactly fits what I'm doing right now to you. You need sth to sooth your burning bro. The Z2 is prettier to me. Ultimately it comes down to aesthetics for me because both phones are truly beasts at what they do. I'd prefer thee HTC One simply because I'm a huge HTC One fanboy. The Sony Phone is utter perfection though. I just wish the back had like this shattered look to it so when you drop it and it actually shatters, you can't tell. So, as per yr conclusions general score is 4-1 in favor of m8. But the z2 has a higher rating in the individual review. Hah ?! hah 8.8 is pretty high for ultragimmickpixel camera. that's what you call cosolation or a balancing act. no ad-subsisting site or blogwould want to offend fans. there should be some redeeming factor somewhere. Straight edgeNexus, if you dont get my point, please don't TROLL. I was only trying to make Nick T confess. It is very clear from the comparison that he prefers the M8. HTC one M8 is a near perfect phone, great design, great specs overall, but only let down by its camera. But had it has a 1/2.3" 8MP ultrapixel sensor, then it is perfect.. It's not all about MP's, but don't even think about printing a photo from the M8 to anything like a 4x6 or 5x8 because it's going to look terrible. I rarely ever do this, but when I do I want a alright pic, not crap. If I had to choose I would go with the Sony, but why not just wait for the LG G3 instead? M8 since it offers more internal memory, and up to 128GB ? at least all flagships released this year can use sandisk's 128GB sd card. that's been tested and proved on some youtube video. Sony has good UI but it should be smooth not laggy... they should focus on optimizing it. I'm using Sony phones from old SE times and though I'm entirely in love with Z2's display I'm thinking of either getting a lumia 930 or oneplus one as my next phone. 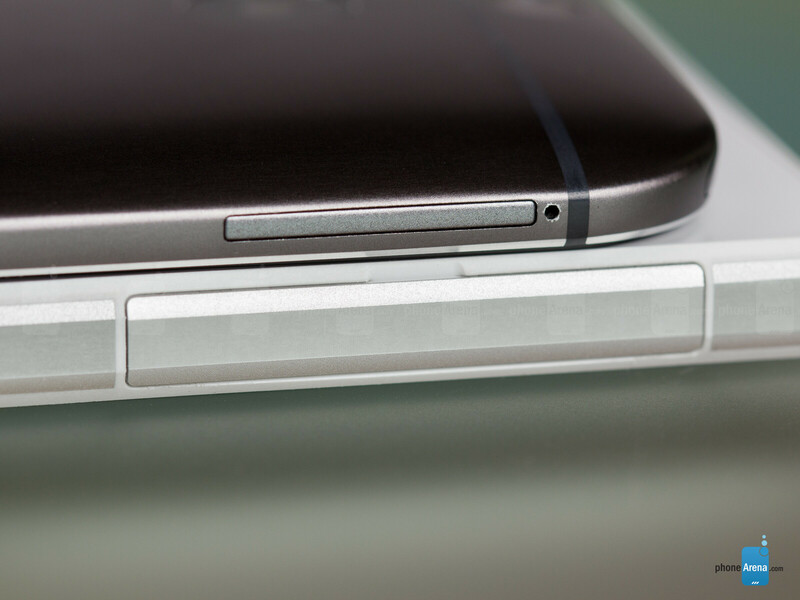 Id give the M8 the edge in multimedia, boomsound+ higher output headphone jack+ ir blaster. Battery life the Z2 kills the M8 and S5 those two respectively do 71hrs and 72 but the Z2 manages 89hrs it's on Gsmarena, but get this that's without any power saving enabled. Yeah i love sense 6, 5 days on and i have no tempt to flash ROMs, unlike s5 touchwiz when i was dying to flash CM.